This week on Music Monday, we’ve got our very first group number with my pick of “Love is a Battlefield” by Pat Benatar for the ladies of New Directions! Love is definitely a battlefield at McKinley High, and I think our girls could use some ’80s chick rock to fight through it. Check out the video for “Love is a Battlefield,” and read on to see why I think the girls of New Directions could totally rock this song. Just like they used Madonna’s “Express Yourself” to, uh, express themselves, “Love is a Battlefield” would be a perfect tune for these ladies to sing about the struggles of dating at McKinley High. Almost all of the girls have had some sort of messy romantic entanglement with one of New Directions’ boys (Hey, Brittany – it’s your turn! Mike or Matt, perhaps? 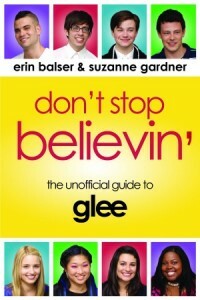 ), so this song of joint female empowerment could help them find solidarity amongst their fellow female glee clubbers. To emphasize the idea of female solidarity and support, I would want each girl to get a few solo verse lines, and have them sing together on the choruses (just like in “Express Yourself”). This song wouldn’t be about any one girl taking the lead because Rachel, Quinn, Tina, Mercedes, Santana, and Brittany all have to be united if they want to survive this romantic warfare!